The S-300V/S-300VM/VMK/Antey-2500 is the world's only truly mobile Anti Ballistic Missile system, and later variants are claimed to be capable of intercepting 4.5 km/sec reentry speed targets. The large size of the Grill Pan phased array and TELAR command link and illuminator antennas is evident. The system provides the capability to engage very low RCS aircraft at ranges in excess of 100 nautical miles. Below: 9M82 Giant round (images © Miroslav Gyűrösi). 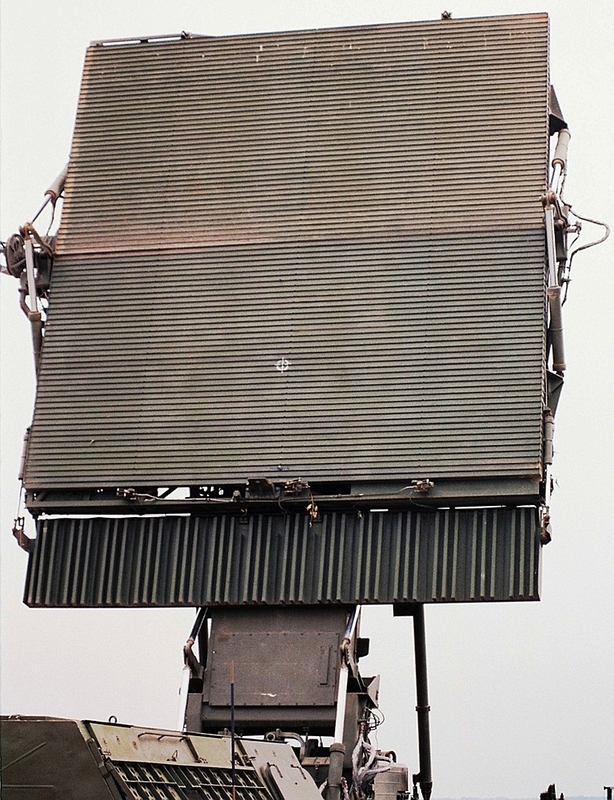 9S32 Grill Pan S-300V engagement radar deployed on an Article 830 series tracked vehicle (NIEMI image). The highly mobile Antey S-300V and S-300VM remain one of the most lethal area defence SAM systems ever developed, firing hypersonic missiles designed to engage aircraft, cruise missiles and ballistic missiles. Designed from the outset for high mobility and effectiveness against targets at all altitudes, the S-300V would have been a key player in any late Cold War conflict. This weapon was developed to provide not only long range area defence, but also to engage and destroy ISR assets like the E-3 AWACS, E-8 JSTARS and U-2, and tactical jammers like the EF-111A Raven and EA-6B Prowler. There have been repeated reports since the beginning of the decade in the Indian media that a buy of this system was imminent, but to date none has materialised. Numerous reports have also surfaced that the PLA is operating either an S-300V or S-300VM variant under the designation of HQ-18, although no hard evidence to support this claim has emerged as yet. From an Australian perspective the possible deployment of S-300V family of missiles in Asia is of major concern. Rapidly deployable, high survivable, and highly lethal, these weapons are especially difficult to counter and require significant capabilities to robustly defeat. The US Air Force currently envisages the F-22A Raptor as the primary weapon used to defeat these capable systems. It is important to note that no F/A-18 variant, nor the Joint Strike Fighter, were designed to penetrate the coverage of the S-300V/VM systems. The survivability of these aircraft will not be significantly better than that of legacy combat aircraft. While Antey's impressive S-300V family of SAM systems shares its earliest conceptual origins with the Almaz S-300P family, the two product lines diverged dramatically very early in their development histories. As a result, they share the same technology base but are essentially unique designs, optimised respectively for the needs of the prime customers, the V-PVO and PVO-SV. 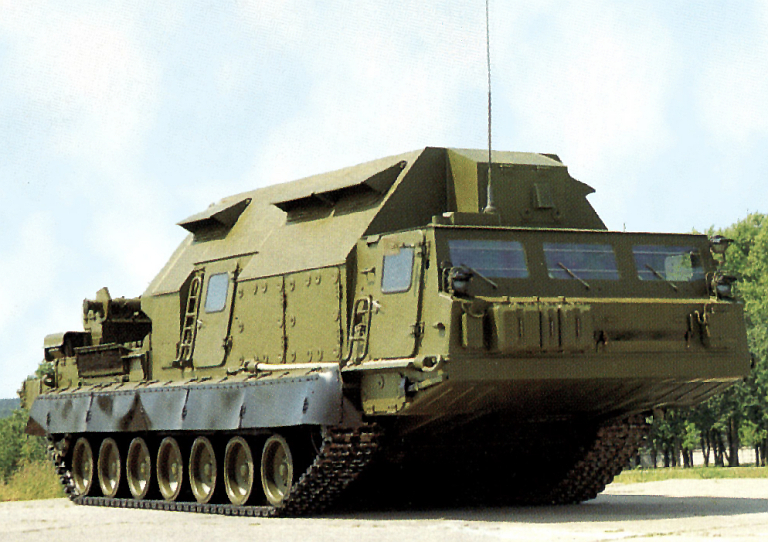 While the PVO-SV shared some static and semi-mobile radar systems with the V-PVO during the early 1960s, the PVO-SV deployed its own unique inventory of fully mobile SAM systems, reflecting its role of providing air defence cover for highly mobile Soviet tank and motorised infantry divisions. By the end of the 1960s the PVO-SV had deployed a three tier system, with the cumbersome ramjet powered command link guided 2K11/3M8 Krug / 1S12 Long Track / 1S32 Pat Hand / SA-4 Ganef system providing long range area defence, the quite effective 2K12/3M9 Kub / 1S91 Straight Flush / SA-6 Gainful system providing medium range area defence and the 9K33 Osa / 9K33 Romb / SA-8 Gecko, 9K31 Strela 1 / SA-9 Gaskin, and ubiquitous ZSU-23-4P SPAAG providing low altitude point defence. With the exception of the large 3M8/SA-4 Ganef this package was widely exported in the Arab world and Africa and whilst achieving some initial success against the Israelis in 1973 generally suffered greviously when applied against Western air power and electronic combat forces. By the early 1970s it was clear that a new generation of systems would be needed to challenge growing Western SEAD and EW capabilities. 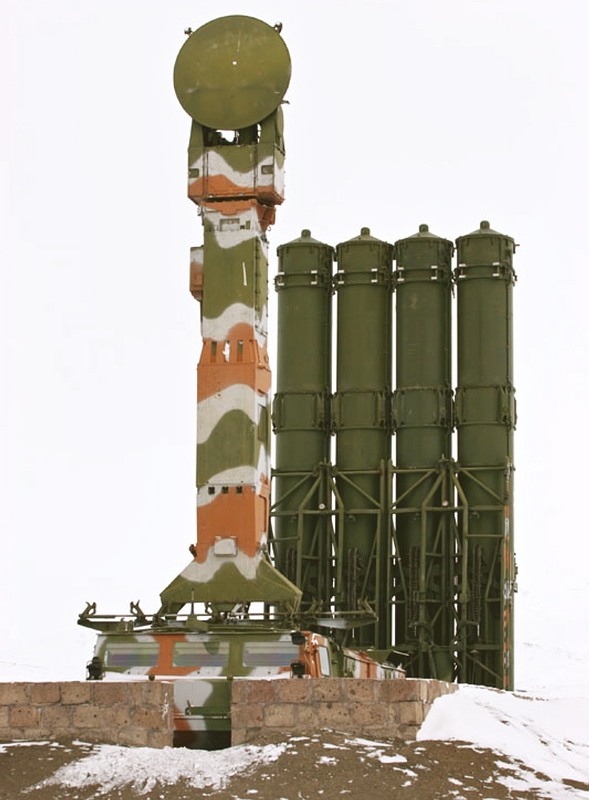 The S-300V system was to provide the top tier in the new air defence umbrella, directly replacing the 2K11/3M8 Krug / 1S12 Long Track / 1S32 Pat Hand / SA-4 Ganef system. Unlike first generation PVO-SV 3M8/SA-4 Ganef the S-300V would have a much broader role, encompassing both long range / high altitude air defence but also defence against US tactical ballistic missiles, specifically the Lance and high performance Pershing I/II, the FB-111A's supersonic AGM-69A SRAM standoff missile, and the new US Air Force MGM-109 Ground Launched Cruise Missile - a trailer launched nuclear armed Tomahawk variant based in the UK and Western Europe. As a result the S-300V would have to provide exceptionally good detection and tracking performance against low radar cross section targets, at very high and very low altitudes, while retaining the very high offroad mobility so typical of established PVO-SV tracked area defence SAM systems, and possessing exceptional resistance to the much feared USAF EF-111A Raven tactical jammer force. 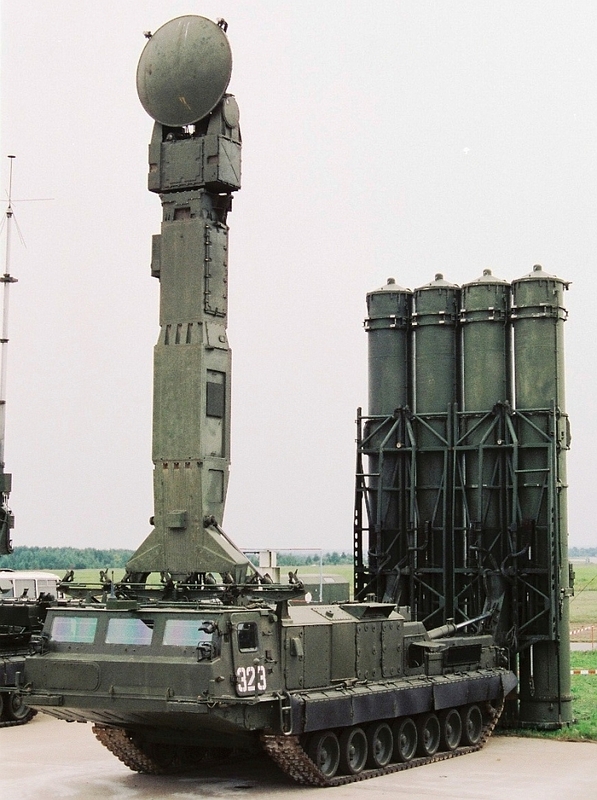 The S-300V was the result of these pressures - an expensive, complex but highly capable dual role SAM/ABM system which remains without equivalent to this day. It was to be an “Army level” or “Corp level” asset, protecting the centre of gravity of the Red Army's mechanised land forces against attack by nuclear and conventionally armed systems. 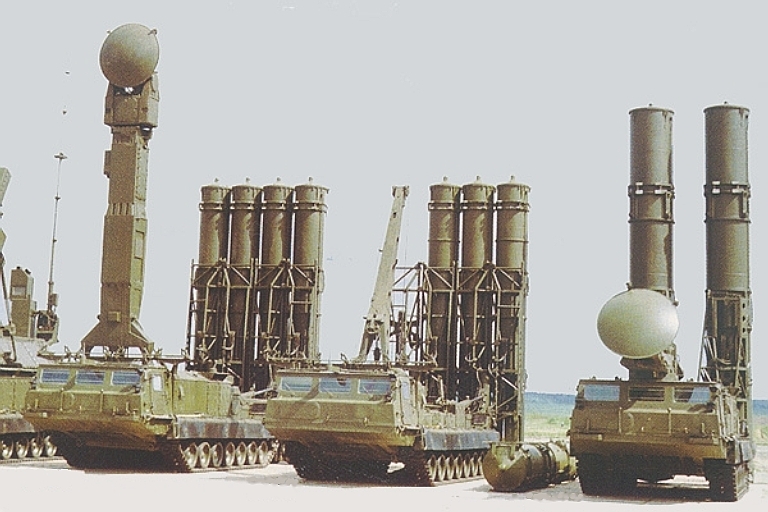 The S-300V was supplanted by the enhanced S-300VM during the 1990s, using the 9S15M2/MT2E/MV2E, 9S19ME, 9S32ME and 9S457ME components, and improved 9M82M and 9M83M missiles. This system has been marketed as the “Antey 2500”, intended to highlight its capability to engage 2,500 km range IRBMs with re-entry velocities around 4.5 km/sec. The 9M82M has double the range of the 9M82 against aerial targets, at 108 nautical miles, and increased terminal phase agility - a single shot kill probability of 98% is claimed against ballistic targets. The S-300VMK is a proposed wheeled configuration of the design, using a BAZ 69096 10 x 10 all terrain truck chassis. Provisional data - Russian sources. 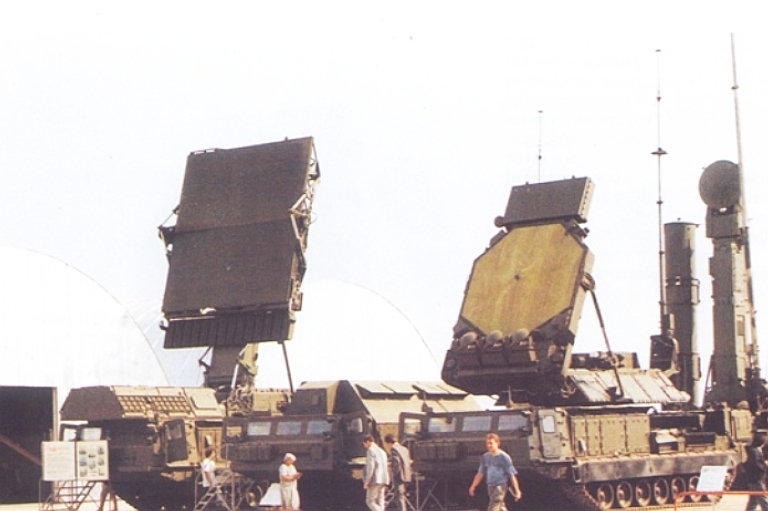 S-300V Battery components, above left to right, 9A83 TELAR, 9A84 TEL/TL with crane elevated, 9A82 TELAR, below left to right, 9S15 Bill Board acquisition radar, 9S457 CP and 9S32 Grill Pan engagement radar. All principal components of the S-300V system are carried on the “Item 830” series tracked vehicle, with gross weights between 44 and 47 tonnes per vehicle - the S-300V is not a lightweight system - and has similar offroad mobility to a medium tank. 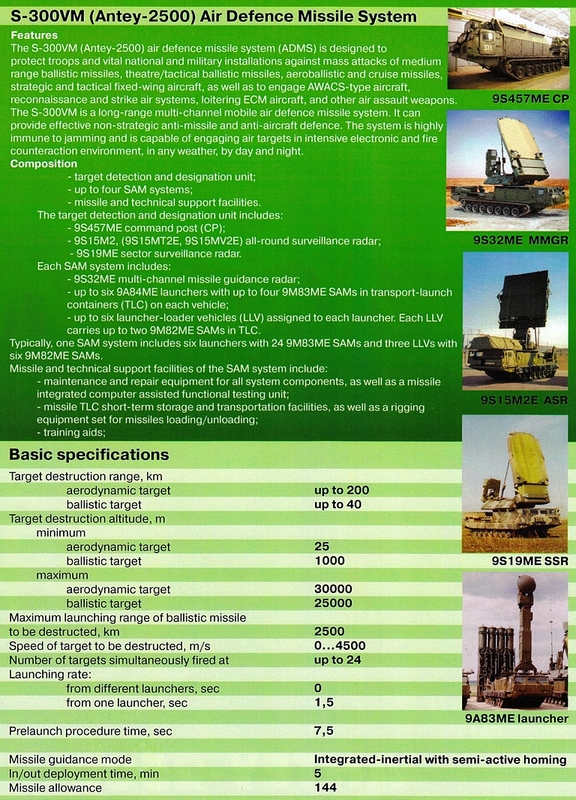 The S-300V system comprises no less than eight unique system vehicles, the 9S457 mobile command post, the 9S15 Bill Board acquisition radar, the 9S19 High Screen ABM early warning radar, the 9S32 Grill Pan engagement radar, the 9A82 and 9A83 TELARs (Transporter Erector Launcher and Radar), and the 9A84 and 9A85 TEL/Transloader vehicles. The paired acquisition radars are each optimised for their specific roles, with a limited overlap in capabilities, as the 9S15 Bill Board has some ABM early warning capability, and the 9S19 High Screen can acquire and track airborne targets. The 9S32 Grill Pan is more narrowly optimised as an engagement radar for missile guidance. The 9A82 and 9A83 TELARs each include high power CW illuminators for missile guidance and command uplinks, and also provide these guidance functions for the 9A84 and 9A85 TEL/Transloaders, which operate as slave TELs in the battery. 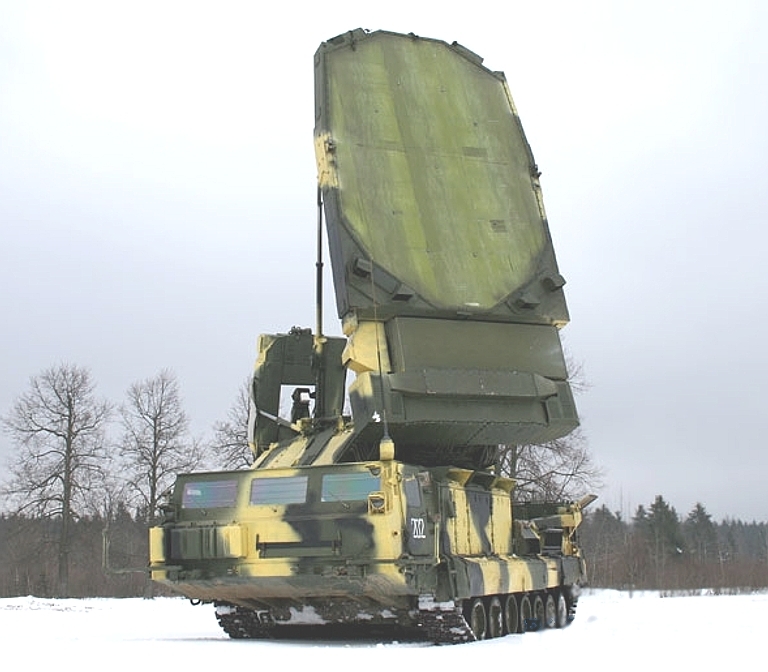 Typical battery integration involves datalink tie-ins with the divisional level 9S52/9S52M Polyana DM series command posts, and the use of the Pori P1 series radar data fusion centre. Often S-300V / SA-12 batteries are supplemented with a 1L13-3 Nebo SV VHF-band 2D early warning and acquisition radar. The S-300VM / SA-23 retains the basic battery structure of the earlier variant, replacing individual components with revised designs. 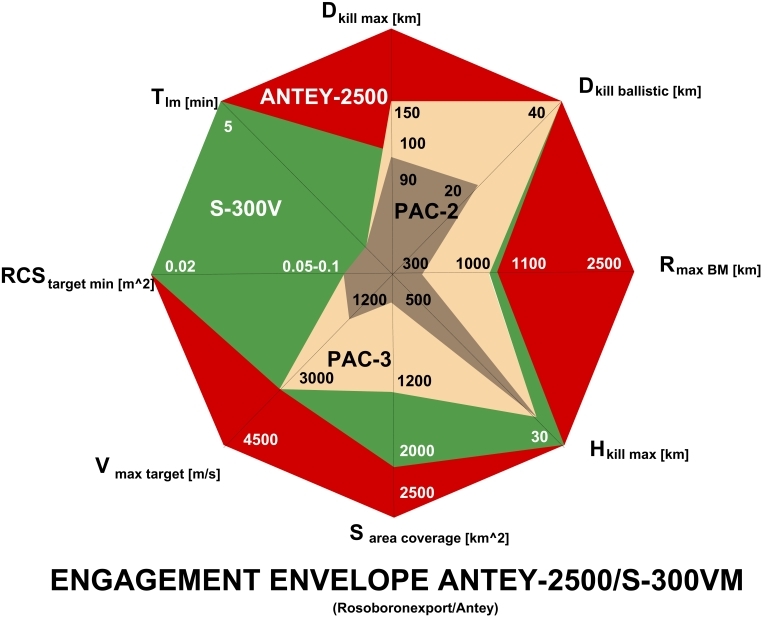 S-300VM / SA-23 battery composition and integration (Antey). 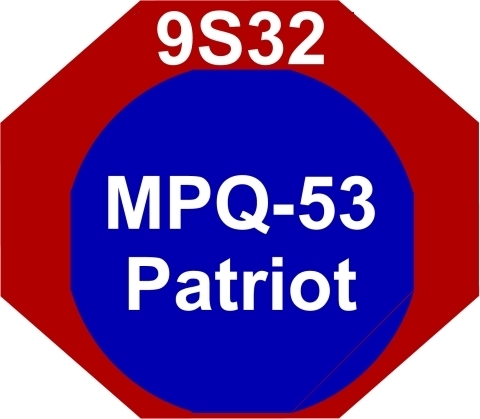 The 9S32 Grill Pan is an engagement radar similar in concept and function to the MPQ-53 and 30N6, but larger with the antenna turret capable of slewing through ±340º. It will automatically acquire and track targets provided by the 9S457 command post, control the operation of TELAR mounted illuminators and generate midcourse guidance commands for up to 12 missiles fired at 6 targets concurrently. 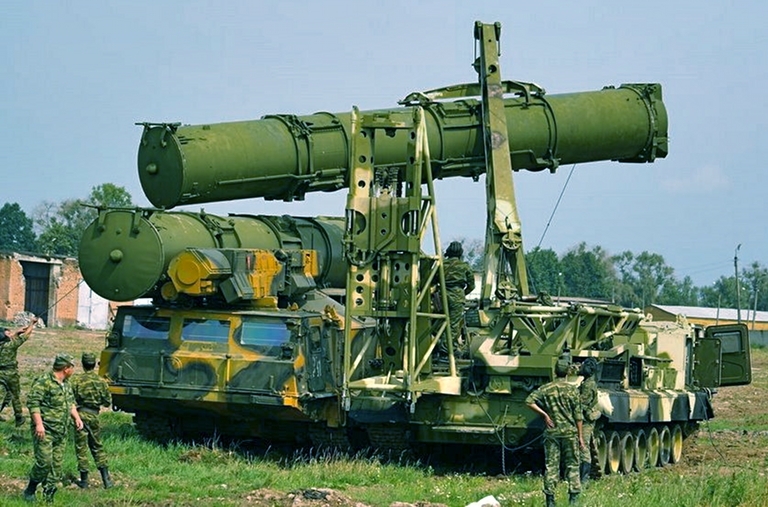 The S-300V system uses continuous wave illumination of targets and semi-active radar terminal homing, not unlike the US Navy RIM-66/67 series SAMs - the illuminators are carried on the 9A82 and 9A83 TELARs. 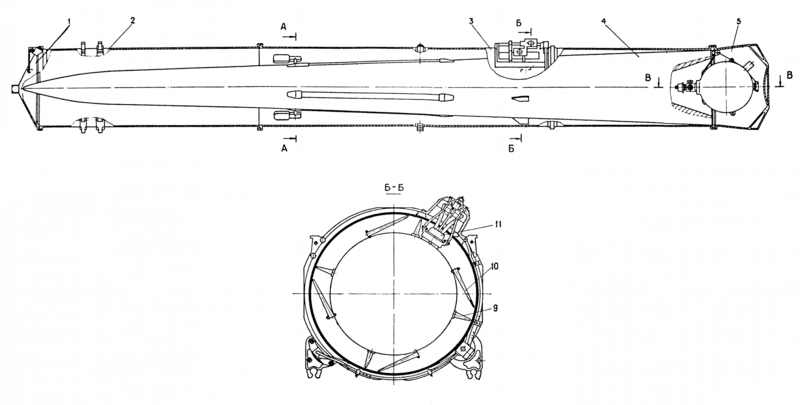 Like the 9S19, the 9S32 is a high power-aperture, coherent, X-band phased array, but specialised for missile guidance producing a mainlobe of around of 1º in width. The TWT based transmitter is rated at 150 kW peak and 10-13 kW average power, with receiver sensitivity cited at 10-17 Watts. Cited detection ranges are about 80 nautical miles for fighter sized targets, 40 nautical miles for SRAM class missiles and up to 80 nautical miles for larger IRBMs. The radar uses monopulse angle tracking techniques, frequency hopping in all modes to provide high jam resistance, and chirped waveforms providing a high compression ratio. Three auxiliary receiver channels are used for cancelling sidelobe jamming. Two basic operating modes are used. In the first the 9S32 is controlled by the 9S457 command post and acquires targets within a narrow 5º x 6º field of view, alternately it can autonomously search and acquire targets within a 60º field of view. A telescoping mast datalink antenna is mounted aft of the array. A more detailed discussion can be found under Engagement and Fire Control Radars, with a detailed technical analysis of the design under David Barton's 9S32/32M Grill Pan Fire Control Radar. 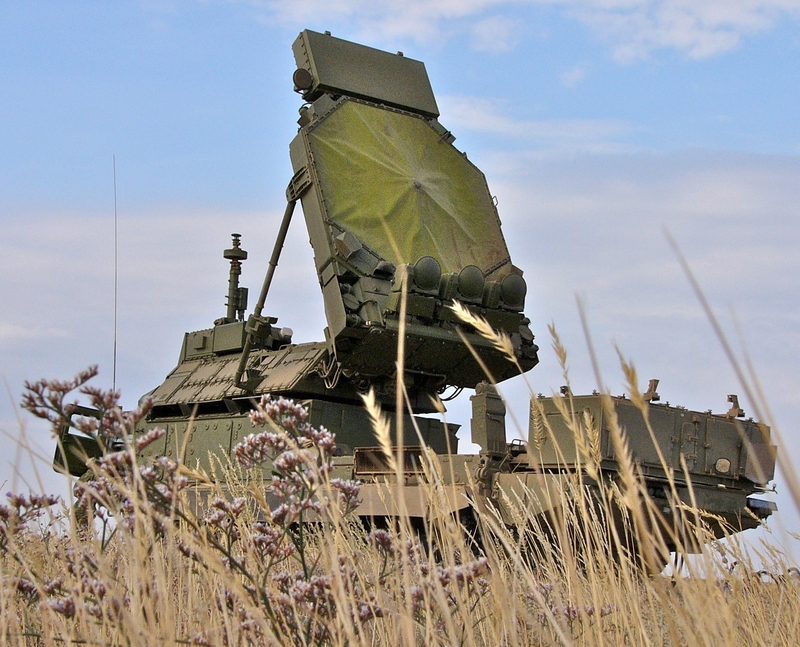 While the S-300VM sees incremental improvements in most components, the 9M32M/ME engagement radar underwent a significant redesign, especially in the antenna. Brochure material produced by the manufacturer shows a design which can be best described as a hybrid of components from the Grill Pan and the High Screen. The larger aperture High Screen array is employed, combined with revised IFF array and interferometer / sidelobe blanker antenna array below the primary aperture. The high and low angle circular polarised monopulse space feeds are retained but repositioned for the different array geometry. The new enlarged aperture will exhibit almost twice the gain of the Grill Pan, much better angular resolution especially for targets near the zenith, and improved heightfinding performance. The 9S32M/ME will have a much higher peak power rating compared to the 9S32 Grill Pan since the additional range of the 9M82M cannot be accommodated by the ~3 dB power-aperture improvement produced by the larger antenna alone. A more detailed analysis will not be possible until good quality imagery of prototypes or production systems becomes available. The 9A82 and 9A83 TELARs carry two Novator designed 9M82 / SA-12 Giant long range SAM/ABMs, and four 9M83 Gladiator SAM/ABMs respectively. Each TELAR is equipped with a steerable high gain antenna used to transmit midcourse guidance commands to the missiles and provide continuous wave illumination of the target for the missiles' semi-active radar seekers during the terminal guidance phase - one source cites 10-12 kW of CW power rating. The TELARs are controlled by the 9S32 Grill Pan using either cables or a bidirectional radio datalink, permitting the TELARs to return status information to the guidance radar. The 9A82 TELAR is optimised for engaging targets at higher altitudes, and can slew its antenna through 180º in azimuth, and 110º in elevation, while the 9A83 TELAR has an elevating and telescoping mast providing antenna coverage of the full upper hemisphere - this arrangement is intended to extend the engagement footprint against low altitude targets. 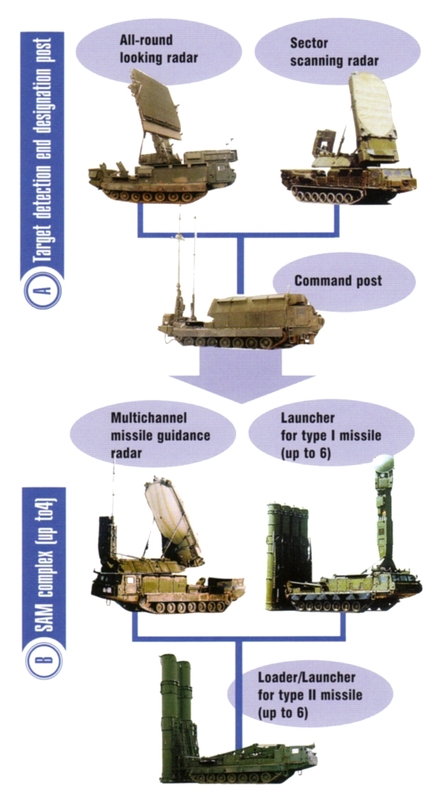 The TELARs are supplemented by the 9A84 and 9A85 TEL/Transloaders, essentially dumb launchers which can be used only with guidance/illumination from a nearby TELAR, and equipped with hydraulic loading cranes instead of antenna booms. A more detailed technical analysis of the antenna design can be found under David Barton's 9A82 Giant and 9A83 Gladiator TELARs. The fully mobile 9S15 Obzor 3 / Bill Board acquisition radar is a mechanically rotated 3D radar system, with electronic beam steering in elevation and an IFF array. It provides long range early warning of aerial threats and low end TBMs such as the Scud A and Lance. The 9S15 has two basic modes of operation. The first is optimised for a 12 second sweep and is claimed to provide a 50% probability of detecting a fighter sized target at 130 nautical miles. The second mode employs a faster 6 second sweep period, and is used to detect inbound TBMs and aircraft, with a reduced detection range of about 80 nautical miles for fighters, and 50 to 60 nautical miles for TBMs like the Scud A or Lance. Russian sources are unusually detailed on ECCM techniques used, claiming the use of three auxiliary receiver channels for cancelling sidelobe jamming, automatic wind compensated rejection of chaff returns, and provisions in the MTI circuits to reject jamming. A facility for precise angular measurement of jamming emitters is included. 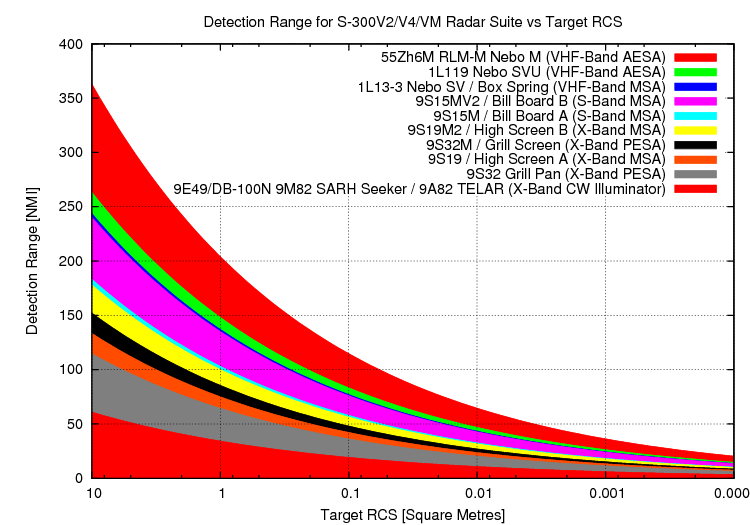 RMS tracking errors are quoted at 250 metres in range and about 0.5 degrees in azimuth/elevation, with the ability to track up to 200 targets. The system has an integral gas turbine electrical power generator for autonomous operation - a feature of most S-300V components. This radar provides a highly mobile 3D search and acquisition capability, but is limited in low level coverage footprint by its antenna elevation. Its limited scan rate makes it unusable for high performance IRBM acquisition and tracking, which is the role of the 9S19 High Screen radar. A more detailed discussion can be found under Search and Acquisition Radars, with a detailed technical analysis of the design under David Barton's 9S15/9S15M/MT Obzor 3 / Bill Board Three-Dimensional Surveillance Radar. The specialised 9S19 Imbir is a high power-aperture, coherent, X-band phased array designed for the rapid acquisition and initial tracking of inbound ballistic missiles within a 90 degree sector. To that effect it uses a large passive phase shifter technology transmissive array, using a conceptually similar space feed technique to the MPQ-53 and 30N6 series radars, producing a narrow 0.5 degree pencil beam mainlobe. The primary search waveform is chirped to provide a very high pulse compression ratio intended to provide very high range resolution of small targets. The design uses a high power Travelling Wave Tube (TWT) source, very low sidelobes and frequency hopping techniques to provide good resistance to jamming. Three primary operating modes are used. In the first the 9S19 scans a 90 degree sector in azimuth, between 26 and 75 degrees in elevation, to detect inbound Pershing class IRBMs within a 40 to 95 nautical mile range box, feeding position and kinematic data for up to 16 targets to the 9S457 command post. The second mode is intended to detect and track supersonic missiles such as the AGM-69 SRAM, and sweeps a narrower 60 degree sector in azimuth, between 9 and 50 degrees in elevation, within a range box between 10 and 90 nautical miles, generating target position and velocity updates at 2 second intervals. The third mode is intended to acquire aircraft in severe jamming environments, with similar angular and range parameters to the second mode. The radar is claimed to produce RMS angular errors of around 12 to 15 minutes of arc, and a range error of a mere 70 metres (at max range 0.04%!). The peak power rating remains undisclosed. 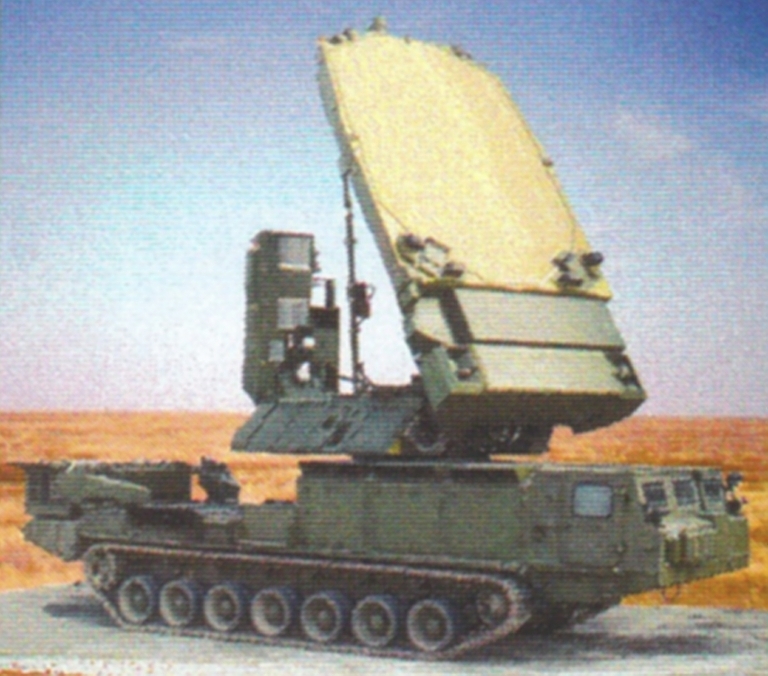 In function the 9S19 most closely resembles much newer Western X-band ABM radars, but is implemented using seventies generation antenna and transmitter technology, and is fully mobile unlike the semimobile US THAAD X-band radar, and Israeli Green Pine. A more detailed discussion can be found under Search and Acquisition Radars. All 9M82 and 9M83 images © Miroslav Gyűrösi. The two stage 9M83 “Type I Missile” / SA-12A Gladiator and 9M82 “Type II Missile” / SA-12B Giant are the guided missiles used by the S-300V / SA-12 system. The missiles are largely common in design, the principal distinctions being different first stage boosters, different control surface arrangements, and numerous detail differences. The conical aerodynamic design and general configuration of both S-300V missiles is modelled on the earlier US Martin Marietta Sprint ABM which was similar in size to the 9M83 / SA-12A Gladiator but had performance closer to the 9M82 / SA-12B Giant. 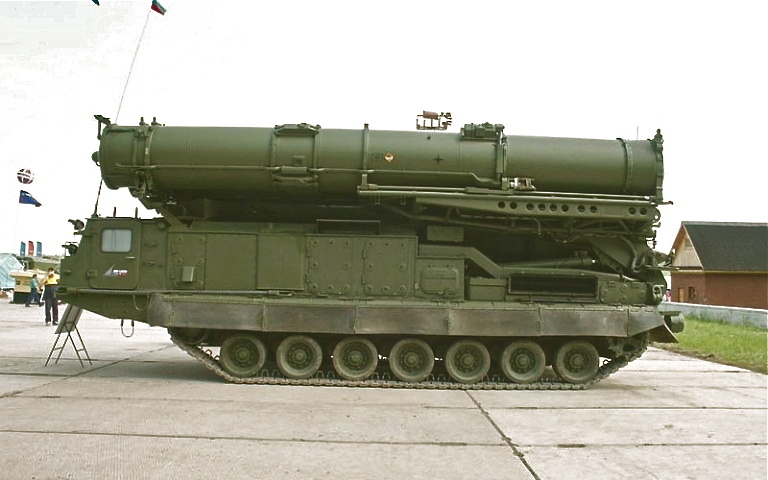 Both Soviet missiles, intended to kill both aerial and ballistic targets, outrange the more specialised Sprint ABM. The smaller 9M83 Gladiator SAM/ATBM is intended to engage aerial targets at all altitudes, including cruise missiles, and smaller TBMs. 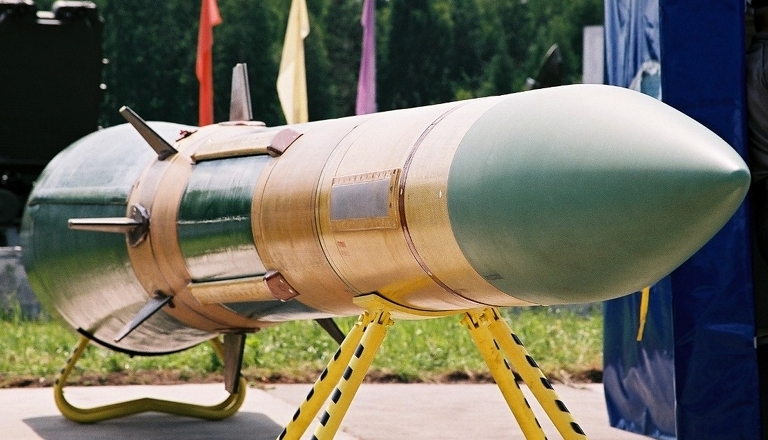 The much larger 9M82 Giant has higher kinematic performance and is intended to kill IRBMs, SRAM class supersonic missiles, but also standoff jamming aircraft at long ranges. Both weapons employ two solid propellant stages, with thrust vector control of the first stage (10,225 lb / 4,636 kg mass in the Giant and ~5,000 lb / 2275 kg in the Gladiator) and aerodynamic control of the 2,800 lb (1,200 kg) second stage, using four servo driven fins, and four fixed stabilisers. The guidance and control packages, and much of the weapon airframes are almost identical, the principal distinction being the bigger booster stage of the Giant and its larger stabilisers8,9. A cold start ejector is used to vertically expel the missile from the 9Ya238/9Ya240 (9M82/9M83) launch tube, using a spherical gas generator in the base of the tube, the 9D128 first stage burns until exhausted, upon which the missile jettisons the spent first stage and transitions to its 9D126 midcourse sustainer powerplant. Immediately post-launch, once the missile has cleared the launch tube, the 9D124 “declination powerplant” is engaged. This is a short burn duration thruster system, which employs several exhaust ports on the lower rim of the first stage nozzle. The purpose of this system is to effect a post-launch pitching manoeuvre to the intended target heading, and optimal elevation (pitch/yaw) angle for initiating the first stage motor burn. Once the missile has been pointed in the desired direction, the first stage motor is started and burns for 3.5 to 6.2 seconds in the 9M82, or 4.11 to 6.4 seconds in the 9M83. Flight control during the first stage burn is effected by four internal nozzle ports for gas injection Thrust Vector Control (TVC), in a manner similar to the Martin-Marietta Sprint ABM and ARPA HIBEX demonstrator. While the US designs injected liquid freon into the exhaust flow, the Novator design draws high pressure exhaust gas upstream of the nozzle and injects it into the exhaust stream at the point where the flow is described as supercritical. 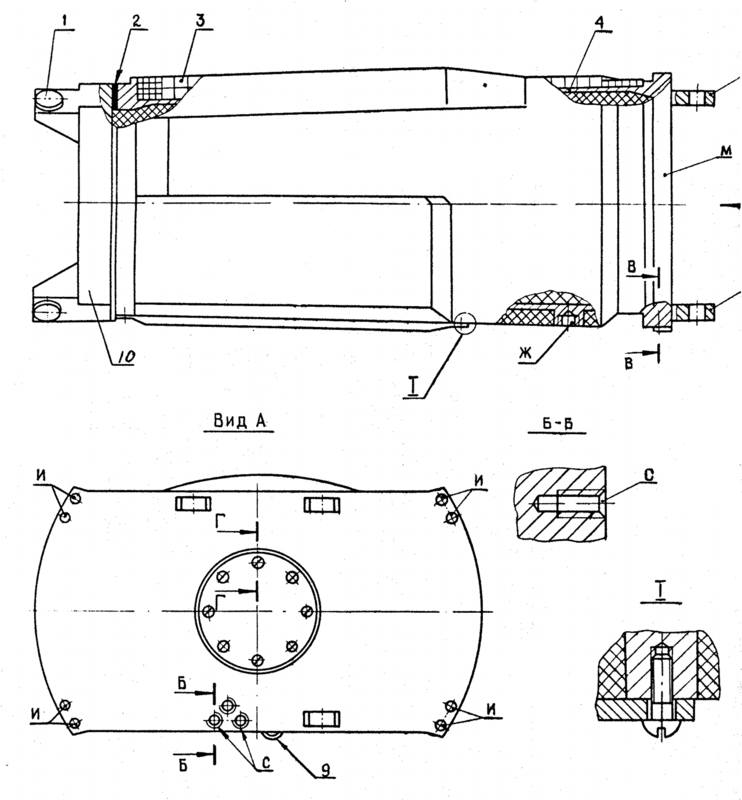 The first stage has a truncated conical shape, with most of the upper portion occupied by the annular conically shaped bonded solid propellant motor, which exhausts into a conventional bell nozzle, with TVC ports located close to the combustion chamber exist aperture. An external cable duct is used to carry electrical power and control signals to the two TVC control systems in the first stage. Once the first stage it expended it is jettisoned by pyrotechnic charge, and the kill vehicle 9D126 bonded solid propellant sustainer is ignited. The sustainer occupies the portion of the fuselage which can be identified by the four symmetrical external cable ducts, which connect the guidance systems in the nose section with the aft section containing control surface actuators and the electrical powerplant. The bell shaped sustainer nozzle in the tail is fed by a central cylindrical exhaust duct which passes through the aft fuselage section. Burn duration is cited at 11.2 - 17.2 seconds for both the 9M82 and 9M83. 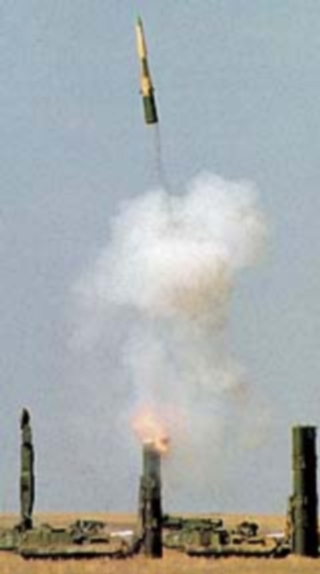 Observation of 9M82 Giant launch footage confirms the stated stage burn durations, and also indicates the use of an energy management profile, where the missile boosts to an apogee, and post apogee flies a pulldown/pullup manoeuvre before transitioning into a shallow dive as it closes with the the intended target. Both missile types employ four actuator driven cruciform tail control surfaces, and four fixed stabilising fins, smaller than the control surfaces in the 9M83, and equally sized in the 9M82. Power for the actuators and guidance avionics is produced by the 9B153 gas turbine electrical powerplant, which drives two AC busses at 1,000 Hz, and two DC busses. High pressure gas is produced by an starting gas generator cartridge and a sustainer gas generator cartridge. During midcourse flight the missile employs inertial navigation. This is performed using the onboard 9B619 digital computer, and a 9B627 inertial unit. Command Inertial Method (KIM): in this mode missile and target position and velocities are uploaded via a datalink channel. In the former mode it transitions to its semi-active homing seeker during the final 10 seconds of flight, in the latter 3 seconds before impact - a technique preferred for heavy jamming environments. The midcourse guidance system attempts to fly the most energy efficient trajectory to maximise range. The datalink channel antennas are embedded in the cruciform tail surfaces. The endgame homing algorithm has not been disclosed. The 9E49/DB-100N semi-active homing seeker will generate target angles and angle rates. It is likely that a P-nav algorithm with lead bias is employed. The antenna is cued to the target pitch/yaw angles during endgame closure by the onboard computer. Russian sources claim the dual plane monopulse two-channel X-band semi-active seeker can lock on to a 0.05 m2 RCS target from 16.2 nautical miles. A two channel radio proximity fuse is used to initiate the 9N127 330 lb (150 kg) class “smart” warhead which has a controllable fragmentation pattern to maximise effect. The missile is also equipped with a self destruct system. As the missile approaches the target, it will perform a rolling manoeuvre to align the directional warhead with the plane of the target. The proximity fused warhead produces a high velocity stream of fragments in a narrow cone normal to the axis of the missile. 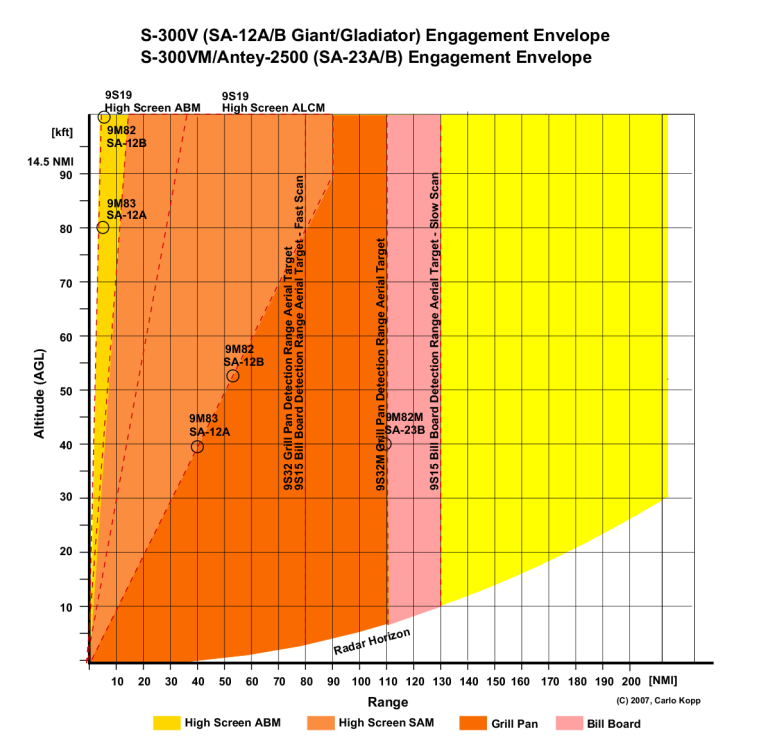 9M82 Giant missile velocity entering the endgame is ~3.5 M.
The engagement envelope of the baseline Gladiator is between 80 ft AGL to 80 kft, and ranges of 3.2 to 40 nautical miles, the Giant between 3,200 ft AGL to 100 kft, and ranges of 7 to 54 nautical miles. 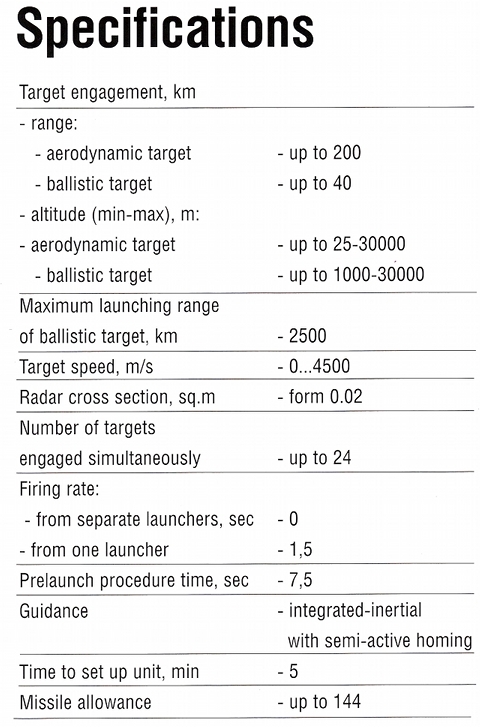 The system can launch the missiles at 1.5 second intervals, and a battalion with four batteries can engage 24 targets concurrently, with 2 missiles per target, and has a complement of between 96 and 192 missiles available for launch on TELAR/TELs. A TELAR can arm a missile for launch in 15 seconds, with a 40 second time to prepare a TELAR for an engagement, and 5 minute deploy and stow times - a genuine “hide, shoot and scoot” capability. The cited single shot kill probabilities for the Gladiator are 50% to 65% against TBMs and 70% to 90% against aircraft, for the Giant 40% to 60% against IRBMs and 50% to 70% against the AGM-69 SRAM - ballistic missiles with re-entry velocities of up to 3 km/s can be engaged. 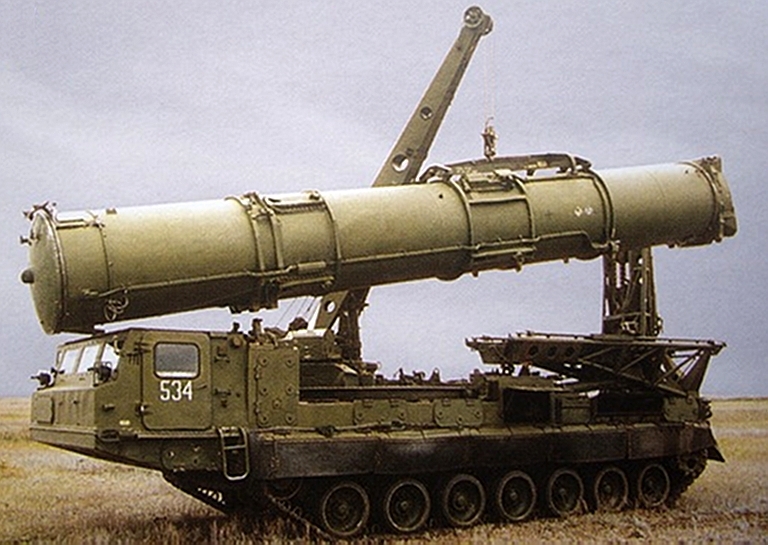 Russian sources credit the missiles with endgame capability against 7-8G manoeuvring targets. The later 9M82M and 9M83M are credited with a 30G endgame capability. The Soviets were terrified of the EF-111A fleet operated by Tactical Air Command and equipped the S-300V system with a facility for passive targeting of support jammers. The 9S15, 9S19 and 9S32 have receiver channels for sidelobe jamming cancellation and these are used to produce very accurate bearings to the airborne jammer, this bearing information is then used to develop angular tracks. The angular tracks are then processed by the 9S457 command post to estimate range, and the 9S32 then develops an estimated track for the target jammer. A Giant missile is then launched and steered by command link until it acquires the target. 9M82 Giant round and 9Ya238 transport container. 9M83 Gladiator round and 9Ya240 transport container. 9M82 Giant round nozzle detail. 9M83 Gladiator round nozzle detail. 9M82 / SA-12B Giant and 9M83 / SA-12A Gladiator Missile Layouts [Click to enlarge]. 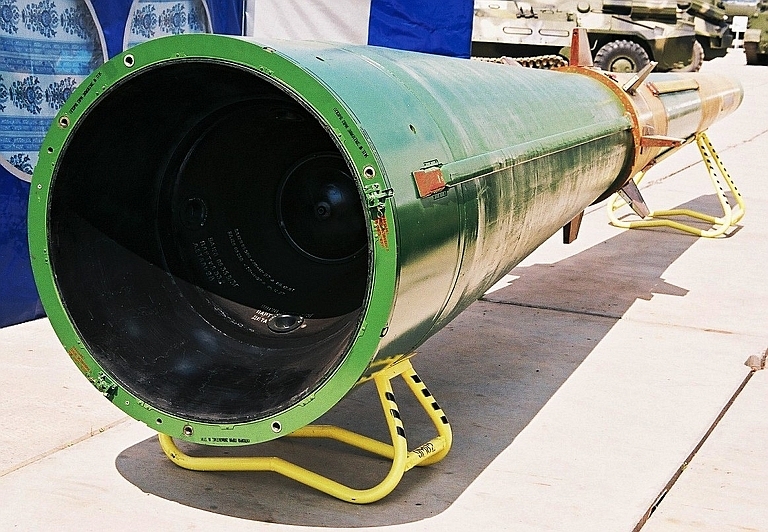 9M82 / SA-12B Giant 9Ya238 Missile Launch Tube / Transport Container. The spherical container (7) in the base of the launch tube is the high pressure gas generator pressure vessel for the cold launch system. The forward and centre missile fuselage is held in position in the tube by supporting braces (8) [Click to enlarge]. 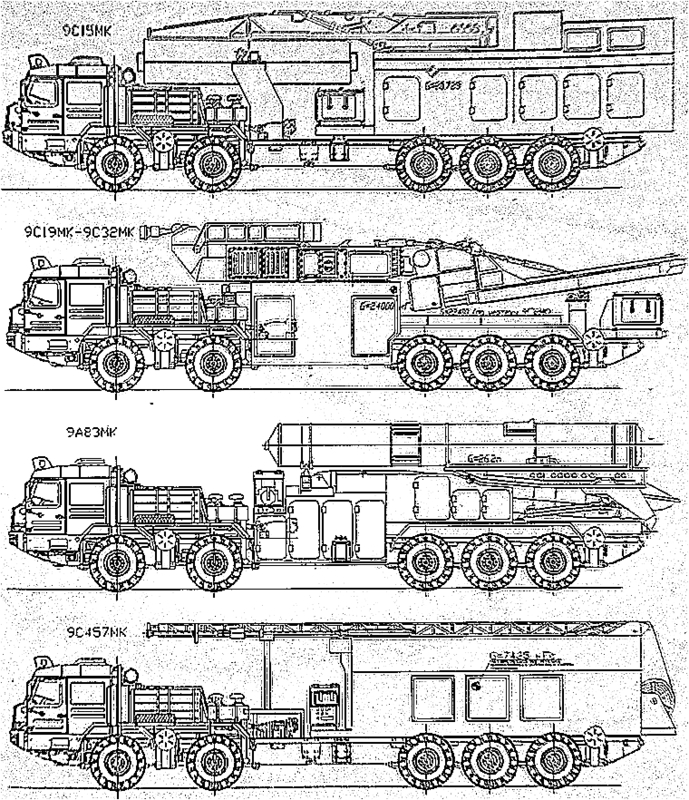 9M83 / SA-12A Gladiator 9Ya240 Missile Launch Tube / Transport Container. The control surfaces are folded before the missile clears the tube, the short span stabilisers are fixed in position [Click to enlarge]. 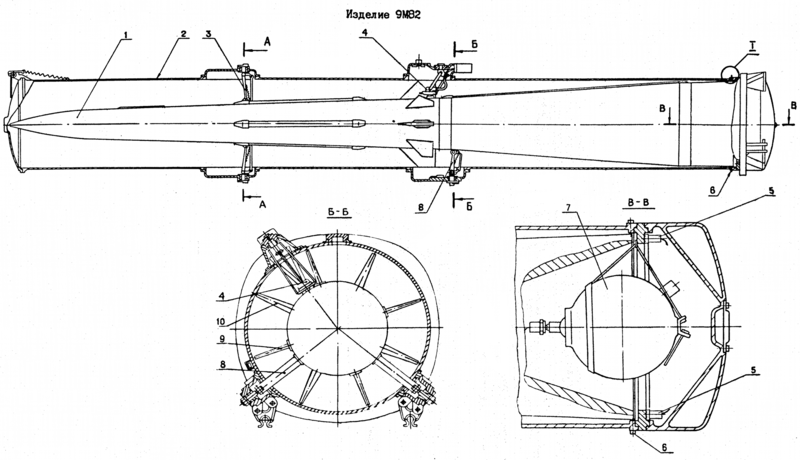 9M82 / SA-12B Giant Missile Cutaway. 1 - Proximity Fuse Antenna; 2 - Seeker Antenna; 3 - DB-100N Seeker; 4 - Proximity Fuse RF Module; 5 - Proximity Fuse Antenna; 6 Computer; 7 - Inertial Guidance and Navigation Unit; 8 - Safety Device; 9 - Warhead; 10 - Cable Duct; 11 - Gas Turbine Module; 12 - Connector; 13 - Connector; 14 - Cable Duct; 15 - Hydraulic Power System; 16 - Switch; 17 - Gas Generator; 18 - Declination Thruster; 19 - Control Actuator; 20 - Compensator; 21 - Stabiliser; 22 - Aerodynamic Control Surface; 23 - Selector Switch; 24 - Stage Separation Mechansim; 25 - Electrical Initiator; 26 - Explosive Charge; 27 - Kill Vehicle Gas Generator; 28 - Control Surface Actuators [Click to enlarge]. 9M83 / SA-12A Gladiator Missile Cutaway [Click to enlarge]. 9M82 / SA-12B Giant Missile Booster Motor [Click to enlarge]. 9M82 / SA-12B Giant Missile Booster Nozzle. I denotes the TVC port [Click to enlarge]. 9M83 / SA-12A Gladiator Missile Booster Motor [Click to enlarge]. 9M82 / SA-12B Giant Missile Sustainer Motor [Click to enlarge]. 9M82 / SA-12B Giant Missile Warhead [Click to enlarge]. 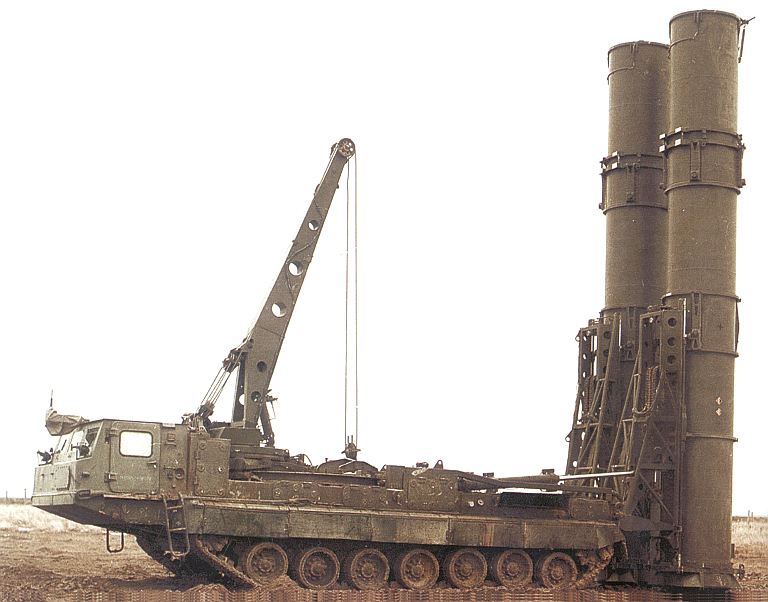 The S-300V was intended to evolve over its life cycle, like other Soviet SAM systems. 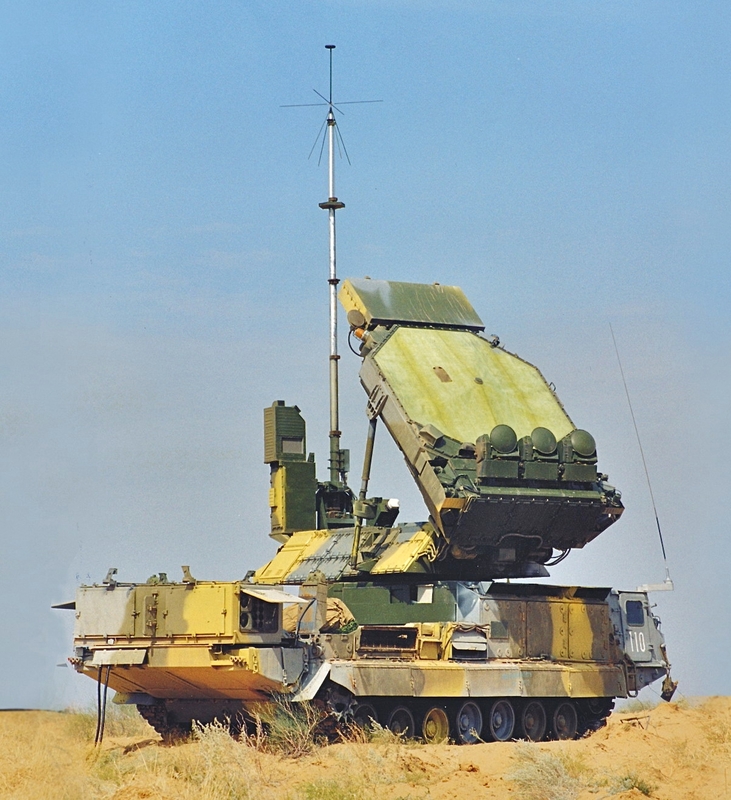 The result of this process was the enhanced S-300VM system which saw incremental improvements to most components, extended range missiles, and a re-engineering of the 9S32 Grill Pan to employ a variant of the 9S19 High Screen space fed phased array, with almost twice the aperture size. 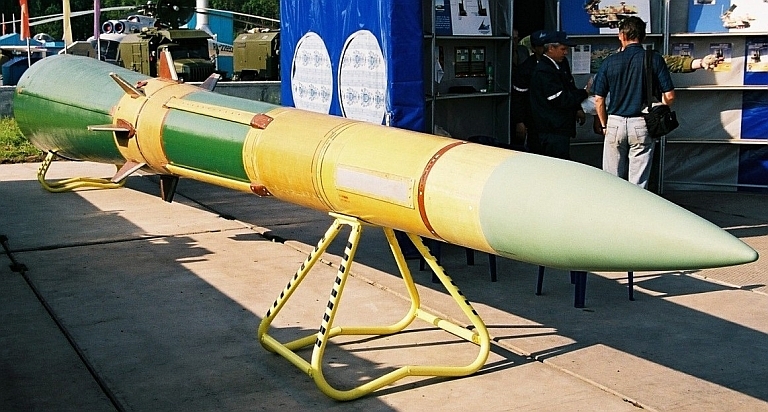 The variant was marketed for export as the Antey-2500. The failure to secure export orders since 1991, in constrast to its technologically simpler and cheaper to build sibling, the S-300P series, has impacted funding for the S-300V program. While a wheeled variant of the S-300VM, the S-300VMK, has been proposed, there is no evidence to date that this design has been prototyped. The long term future of the S-300V series is not clear, as Russia's long term planning for PVO and PVO-SV units is focussed on the S-400 and S-500 systems, evolved primarily from the S-300P series. The S-300V/VM system remains on offer for export clientele and should an export client be eventually found, others might follow. In the longer term the in-service inventory S-300V is acquiring similar evolutionary enhancements to the S-300P series. It is also likely that GPS/Glonass aided navigation hardware will be added at some stage to both the S-300V/VM to increase the accuracy of the inertial/compass navigation systems on the radars and TELAR/TELs. S-300V4: “deep modernisation” with improvements over the S-300V3, providing “1.5 - 2.3 times the capability of earlier variants”, and intended for deployment with Russian Army units in 2011. At this time virtually nothing of substance has been disclosed on the configuration of the S-300V4 block upgrade, with many sources simply claiming it to be “classified”. The cited doubling of aerodynamic target engagement range would suggest the use of the kinematically improved 9M82M and 9M83M missiles, developed for the S-300VM, and possibly the much improved 9S32M Grill Screen engagement radar, also developed for the S-300VM. 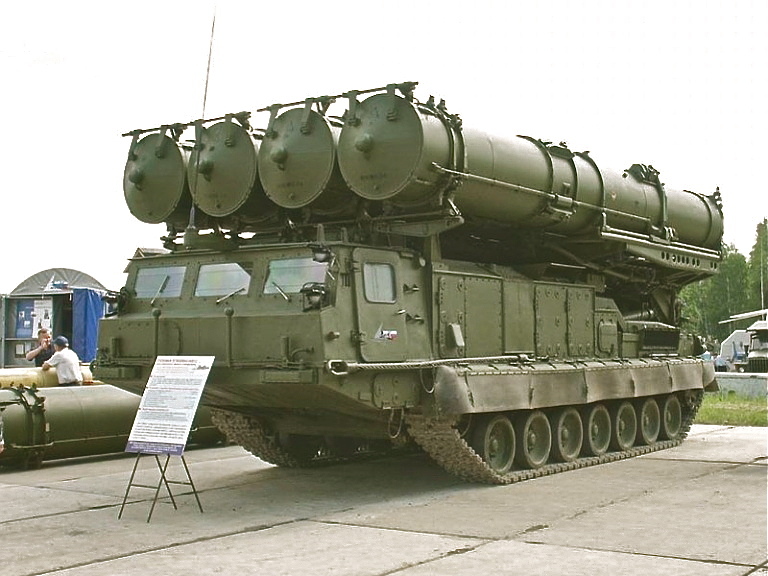 It remains to be seen what other portions of the S-300VM/VMK designs will migrate into the S-300V4. The term “deep modernisation” in Russian literature can often mean almost complete replacement of most of a legacy design. It is likely that the S-300V4 upgrade will be designated by NATO as an SA-23 system. The improved 3K81M/S-300VM/VM1/VM2/VMD/VME/Antey-2500 or SA-X-23/SA-23 is most easily differentiated from the 3K81/S-300V by the redesigned 9S32M/ME Grill Screen engagement radar, but no less importantly it employs kinematically superior 9M82M/ME missile rounds. The acquisition radars are the improved 9S15M/MV / Bill Board B and 9S19M2 Imbir / High Screen B. 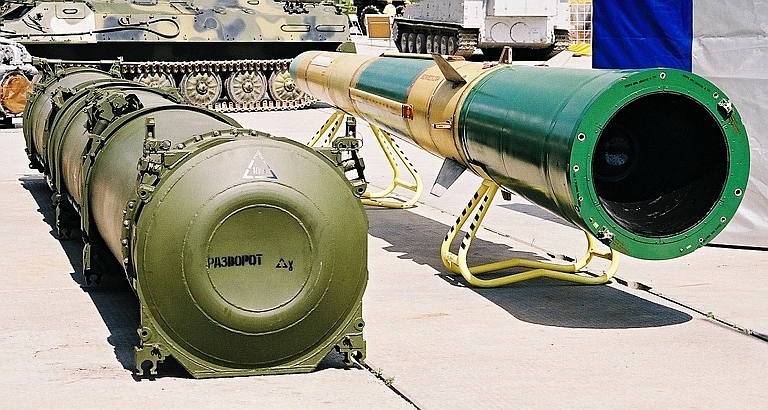 Cited range performance for the 9M82M missile was initially 200 km against aerial targets, but more recently this is cited by the manufacturer at 250 km. Cited range improvements for the 9S15M2 Bill Board B are 320+ km versus the Bill Board A, and for the 9S18M2 High Screen B 250 km versus 175 km for the High Screen A. The most prominent change in the radar suite is the 9S32M Grill Screen, which employs the much larger space fed antenna design of the 9S32 High Screen, and a higher peak power. 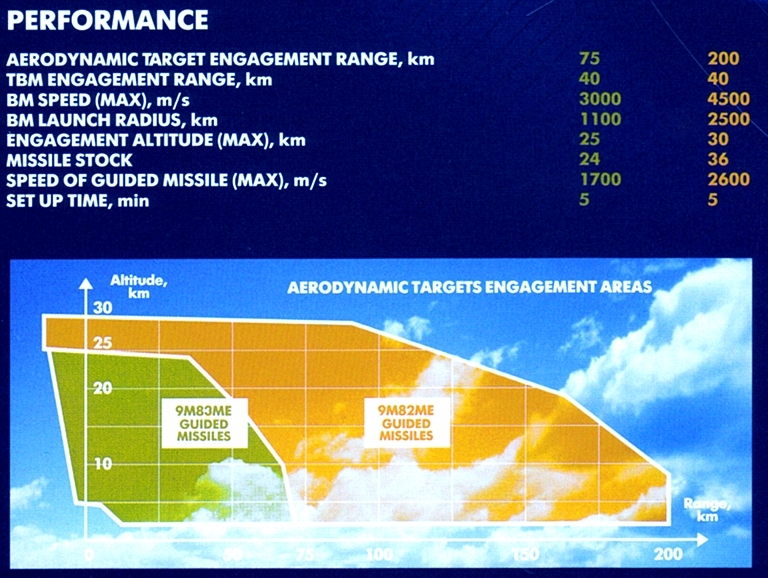 The cited range performance for a fighter sized target is in excess of 200 km, and likely better than 250 km given the more recently revised kinematic range for the 9M82M missile. 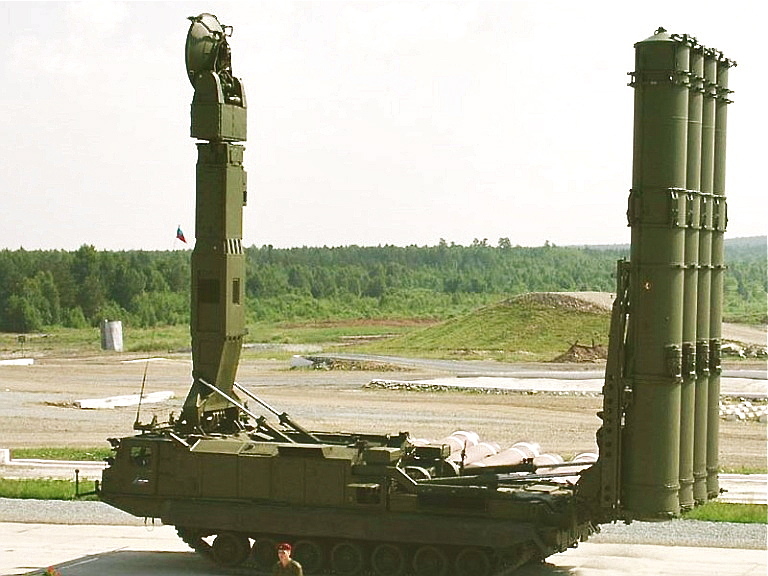 While the range performance of the 9M82M/ME and 9M83M/ME missiles against aerial targets is not as good as the contemporary S-400 / SA-21 40N6 missile, the 9M82M/ME matches the kinematic range of the S-400 / SA-21 48N6E3, and outperforms the S-300PMU2 Favorit / SA-20B 48N6E2 missile, and all earlier 48N6 series missiles. In terms of performance against ballistic targets, the 9M82M/ME outperforms the 48N6E2 missile and provides almost identical performance to the much newer 48N6E3 missile. Importantly, the two stage S-300V/VM missiles are built for much higher acceleration than the S-300P missiles, also reflected in launch footage. The result is that for engagements against aerial targets, the S-300V/VM missiles have a shorter time of flight, and at similar ranges will have considerably higher kinetic energy for endgame manoeuvres compared to their single stage 48N6 series cousins. The cited average speed for the 9M82 missile across the whole trajectory is around 85-90% of the maximum speed cited for the 48N6E2/E3 missiles. The shorter flight time and higher endgame energy of the S-300V/VM missiles reduces available reaction time for the aircraft under attack, which will be reflected in higher missile lethality. 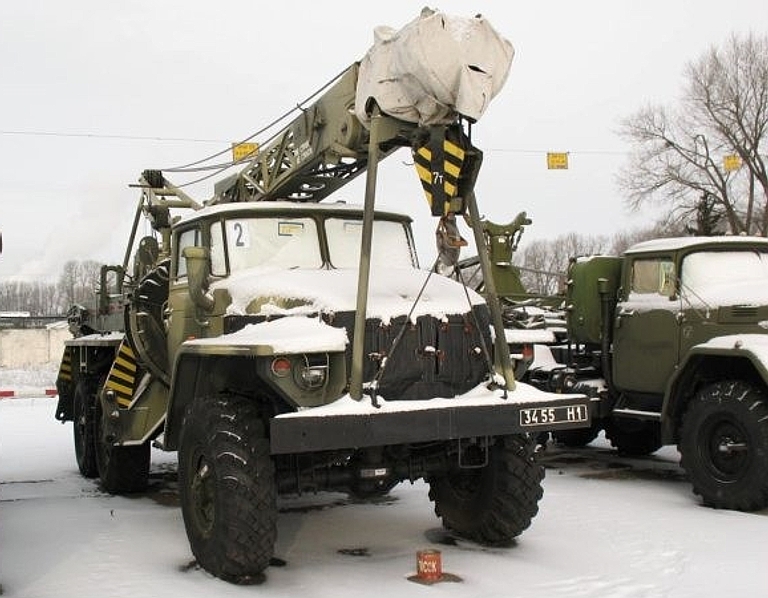 A proposal which emerged over the last decade is the S-300VMK (K - Колесные), a variant of the S-300VM in which the Article 830 series tracked chassis is replaced by the BAZ 69096 10 x 10 all terrain truck chassis, a vehicle design more frequently associated with heavy cranes and drilling rigs. This vehicle family is also used for the new S-400 Triumf 5P85TE2 TEL. 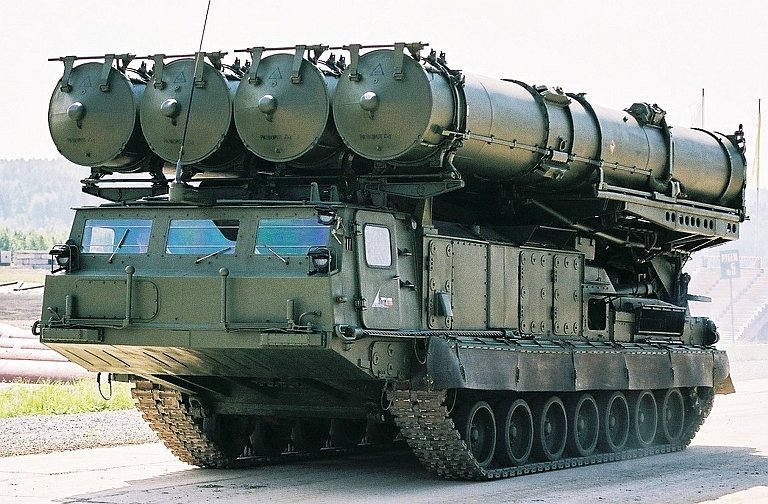 The S-300VMK was to be hosted on a variant of the 10 x 10 BAZ-69096 (image © 2011 Michael Jerdev). 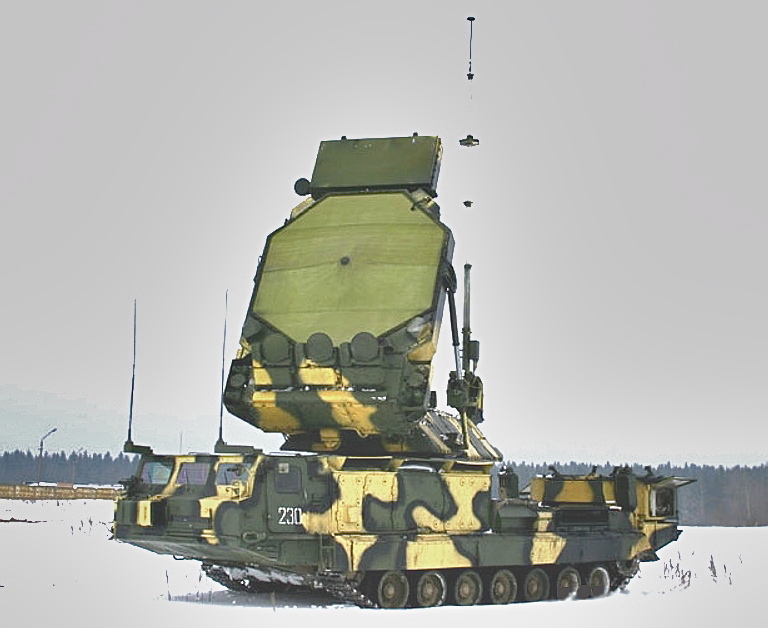 The intent behind a wheeled chassis is likely to be compliance with the post 2005 Russian MoD policy change to wheeled SAM system chassis rather than tracked. A wheeled variant is less costly to procure and operate, and provides much higher road speed at the expense of cross country performance. 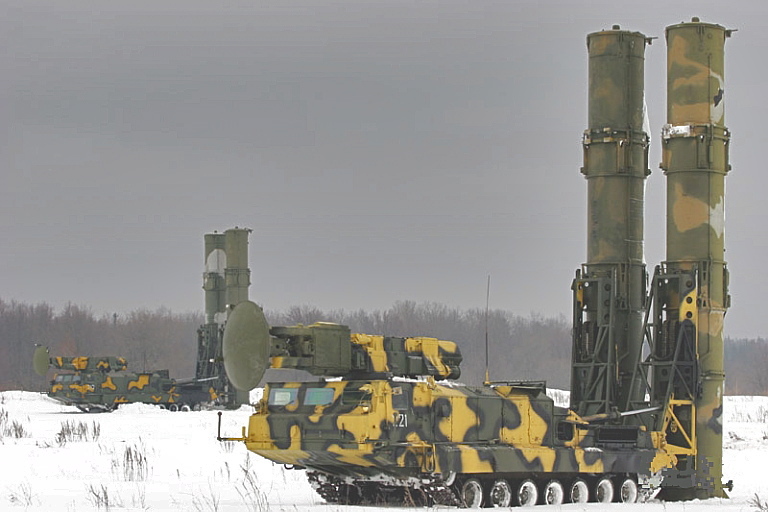 Very little material has emerged to date on the S-300VMK and the design may have been shelved with the failure to secure export orders for the S-300V/VM product family. 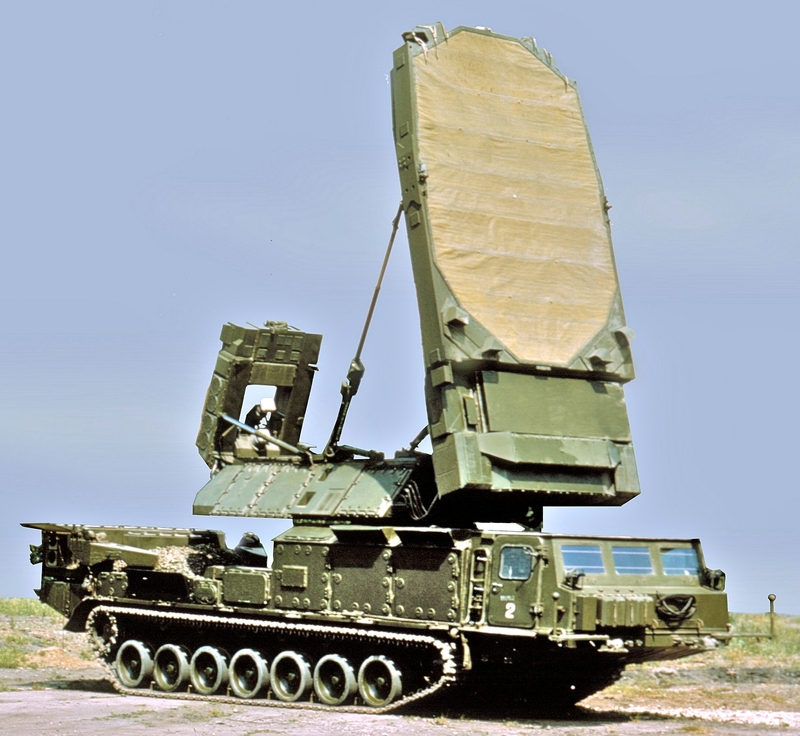 However, this does not preclude a future transplant of the extant S-300V radar/TELAR inventory to the BAZ 69096 chassis on operating cost and supportability grounds, as is occurring now with legacy ZRK Romb/SA-8B Gecko systems, which are being transplanted to new MZKT-6922 vehicles. 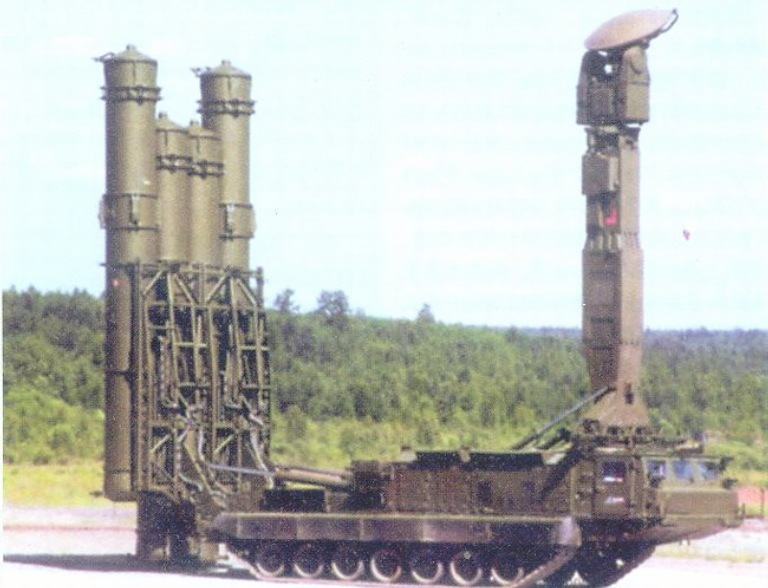 S-300VMK in stowed configuration. The 9A82MK TELAR and 9A84MK, 9A85MK TELs are not depicted. Note the large elevating mast on the 9S457MK CP (Russian Internet - unknown author). The baseline S-300V / SA-12 entered production during the very early 1980s, and was accepted into service by the PVO-SV in 1983 under the designation S-300V-1, but was limited in capabilities. 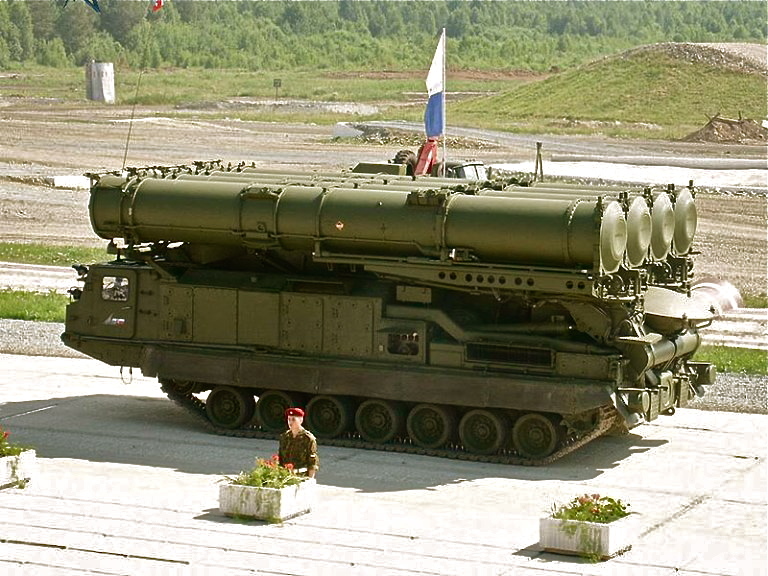 Difficulties with the complex technology delayed service entry of the fully developed package with ABM capability until 1988, under the designation S-300V. 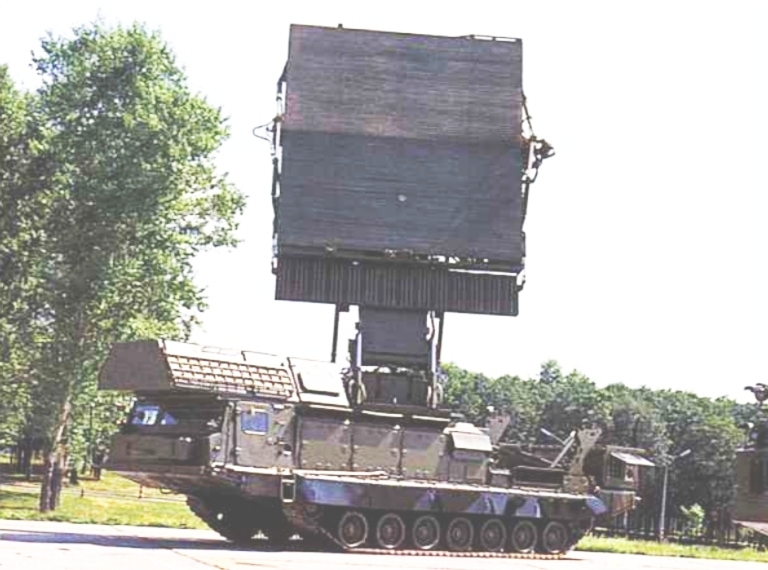 The only serious export prospect until recently has been India who have since acquired a pair of Israeli Green Pine ABM early warning radars, as a counter to Pakistan's nuclear armed ballistic missile force. 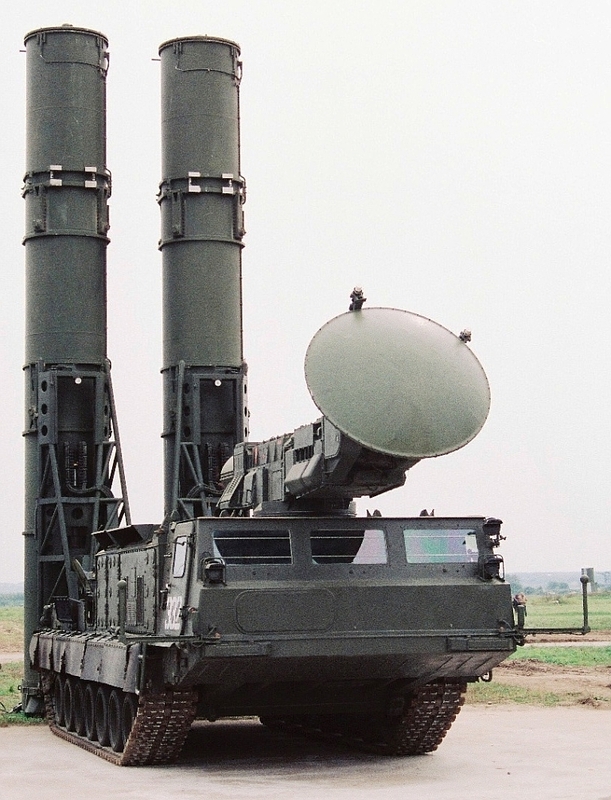 The cited order for six S-300VM systems remained in negotiation, while the Israeli Arrow and S-300PMU2/S-400 are evaluated. There is no evidence this has since progressed. A marketing drive in the Persian Gulf some years ago fell foul of US influence in the region - Patriots being bought instead, amid Russian allegations of dishonest marketing tactics by the US contractors. The Soviet Union unravelled in 1991, leaving the service inventory of S-300V / SA-12 systems scattered across a number of former Soviet Republics. Russian sources cite current operators to be Russia and the Ukraine, with some claims that Belarus operates some units. 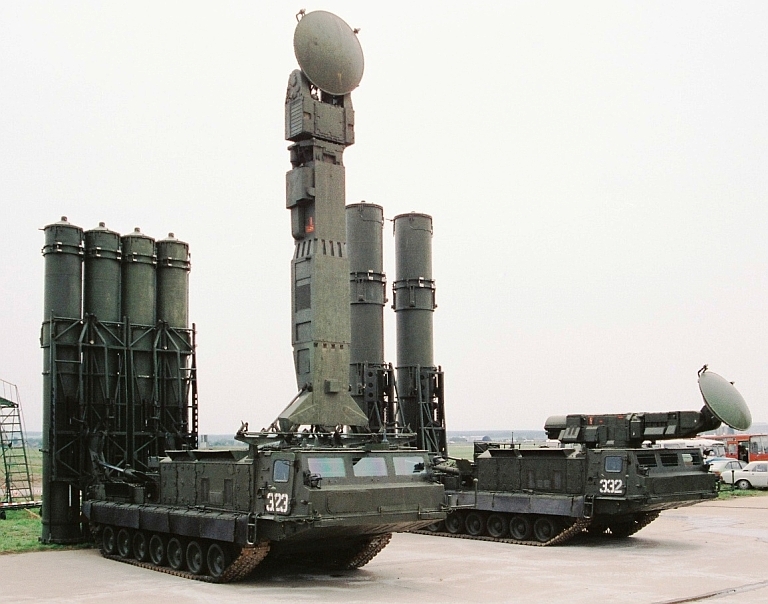 Commercially the S-300V/VM has been much less successful than the PVO optimised S-300P series, in part due to its higher cost and capability - the often discussed Indian sale has yet to materialise, compared to the large number of S-300PMU/PMU1/PMU2 systems sold to the PRC. 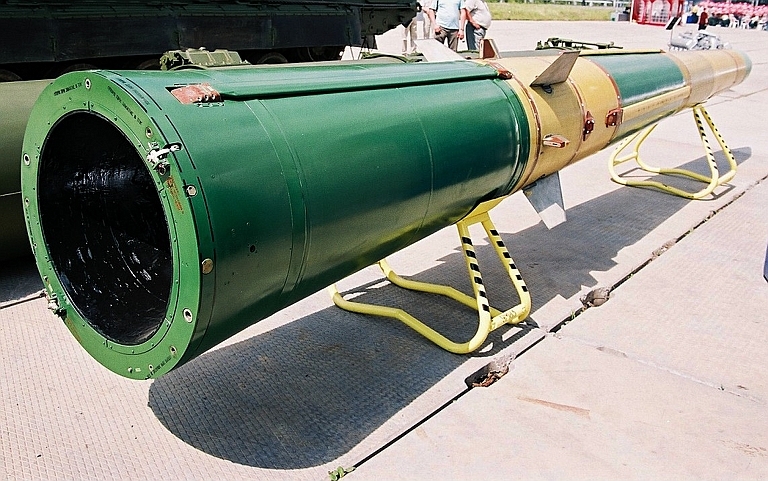 In 2003 the Russian government authorised a merger between Almaz, Altair and Antey to produce what is likely to be world's largest SAM system manufacturer. Reports emerged in late 2010 that Venezuela had ordered at least one battery of the S-300V system, presumably refurbished Russian inventory equipment. The claim was reiterated in a Russian Interfax agency report of the 15th April, 2011. 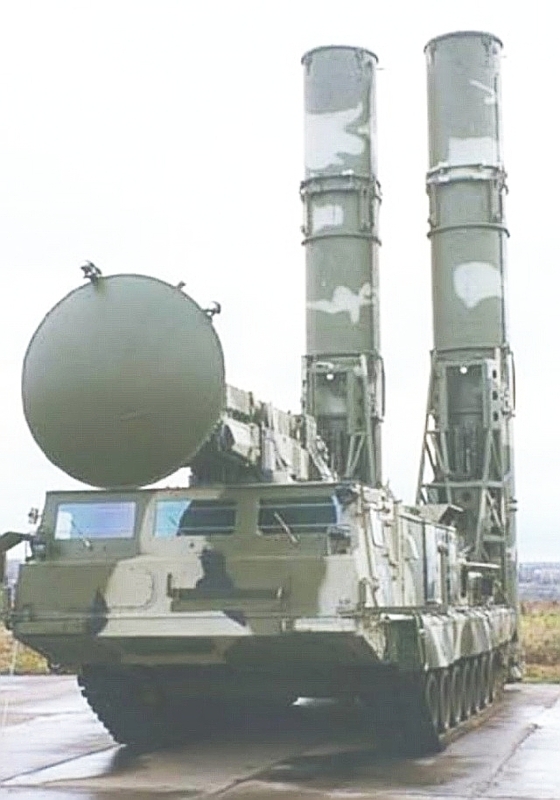 Other claims for the Venezuelan order include twelve regiments of the missile, the S-300VM/Antey-2500 missile, the S-300PMU1 and S-300PMU2 missiles. 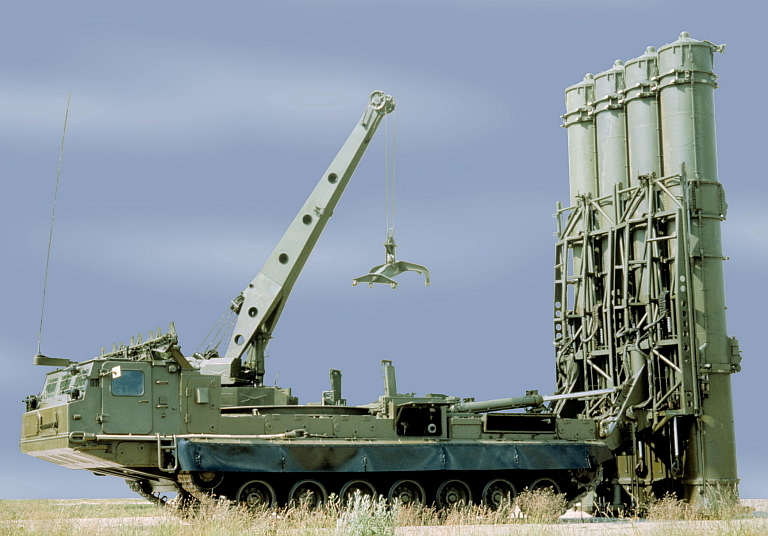 Like the S-300P series systems, the S-300V uses the cold launch technique, originally developed for rapid reload ICBM silos, ejecting the missile before its motor is fired. These 9M83 SAMs are being launched from a 9A83 TELAR, which uses its elevated directional antenna to provide the 9M83 with both midcourse command updates and terminal phase high power continuous wave illumination of the target. Antey claim the semi-active seeker will acquire a 0.05 square metre RCS target at 16 nautical miles (Rosvooruzheniye). 9A82 TELAR deployed (Image © Miroslav Gyűrösi). 9A83 TELAR deployed (Image © Miroslav Gyűrösi). 9A83 TELAR stowed (Image © Miroslav Gyűrösi). 9A84 TEL/Transloader loading a 9A82 TELAR (Russian Internet). 9A84 TEL/TL in operation (NIEMI images). 9A85 TEL/TL in operation (NIEMI image). Above, below: 9S32 Grill Pan S-300V engagement radar deployed on an Article 830 series tracked vehicle (NIEMI images). 9S32 Grill Pan deployed (Image © 2009, Sergey Kuznetsov). 9S32M/ME Engagement Radar. This design is hybrid of components from the 9S19 High Screen and 9S32 Grill Pan. It has improved range performance, cited at 200 km but likely better (Antey). 9S15MT Bill Board (Image © Miroslav Gyűrösi). Additional Images , . 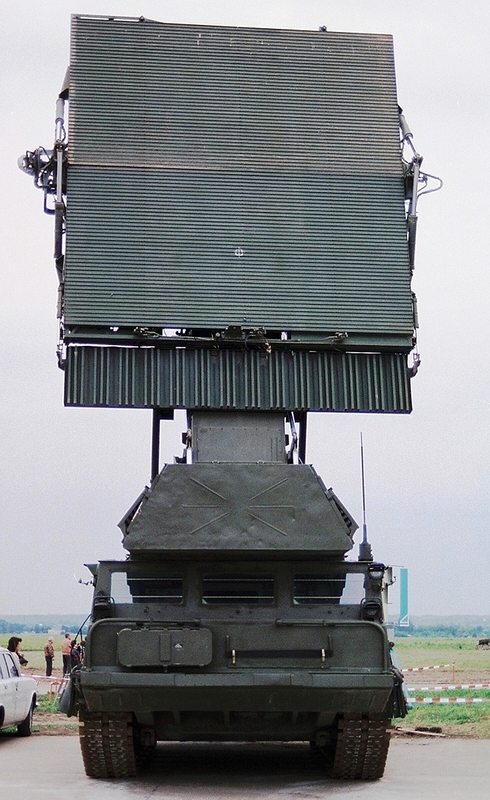 9S19 Imbir / High Screen acquisition radar (Image © 2009, Sergey Kuznetsov). 9S19 Imbir / High Screen acquisition radar (NIEMI image). 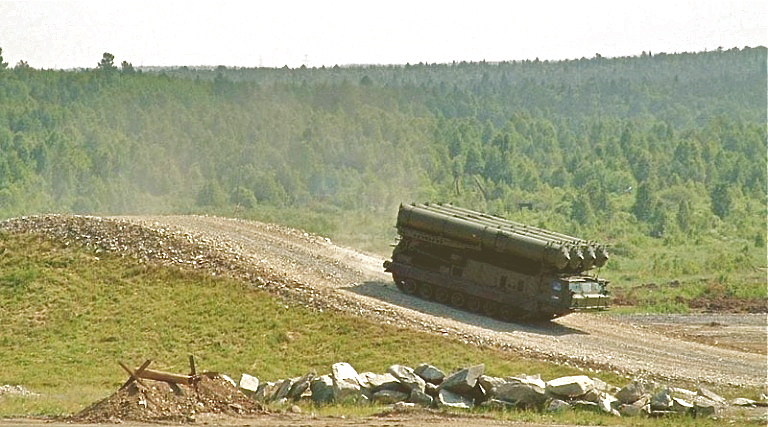 The 9S457 series is a dedicated and fully integrated self propelled command post for the S-300V/SA-12 battery (NIEMI image). The 9T32M1 self-propelled crane is a late model of the standard loading crane used with 2K12 / SA-6 Gainful and 9K37M1 / SA-11 Gadfly batteries. The URAL-375 chassis is used. (Russian internet). 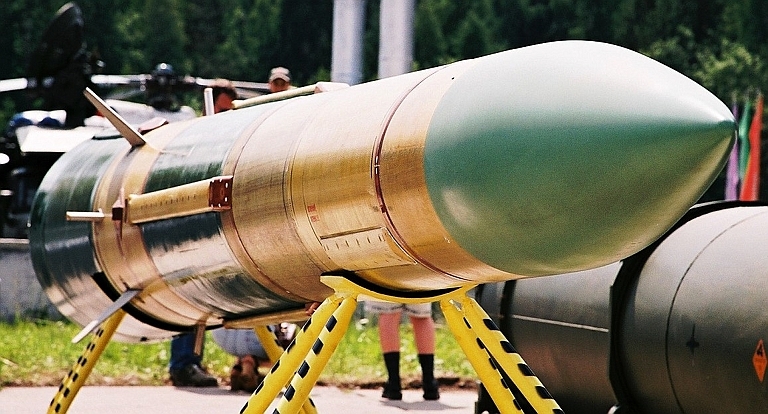 Above: Sprint ABM prototype (US DoD); below: 9M82 Giant (© Miroslav Gyűrösi). The nearest Western equivalent to the S-300V/VM missiles was the Martin-Marietta Sprint Anti-Ballistic Missile (ABM), an endo-atmospheric interceptor developed for endgame terminal defence of high value strategic targets under attack by Soviet ICBMs and SLBMs. 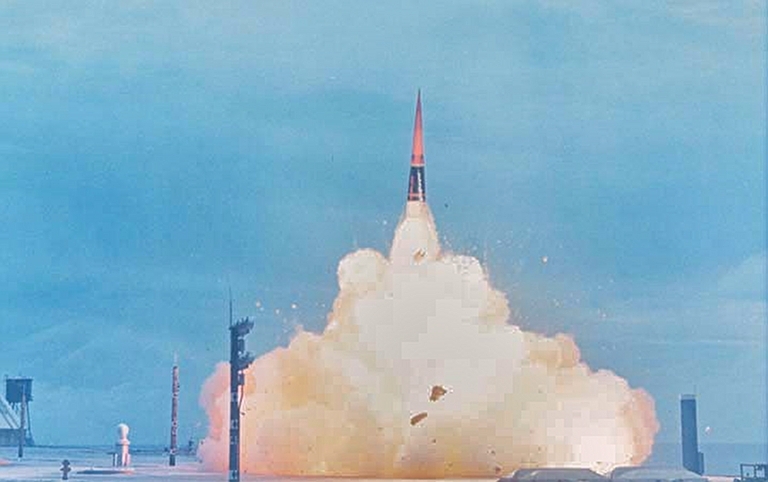 While the Sprint was successfully tested from mid-1960s, the program was cancelled very shortly after the first Safeguard ABM site equipped with Sprint missiles attained IOC in 19756. The basic design of the S-300V missile airframe, propulsion system and control system closely reflects the Sprint design. Unlike the Sprint which was a dedicated ABM interceptor armed with a low yield nuclear warhead and guided by command uplink, the S-300V missiles are dual role designs intended to kill ballistic missiles and aircraft, and employ a semi-active radar homing terminal seeker, and a directional conventional warhead. The common second stage design of the Russian missiles, with a dual plane monopulse semi-active radar seeker under an ogival radome and 150 kg warhead, is much larger and heavier than the simple command link guided Sprint second stage. As a result, the 9M83 Gladiator missile falls short of the performance of the Sprint, despite almost identical launch weight and dimensions for both missiles. The 9M83/9M83M Giant missile delivers similar performance to the Sprint, but using a missile which is 66% heavier at launch, and considerably larger. The S-300V missiles therefore represent yet another example of US technology and concepts being adapted and improved upon by the Soviets. Sprint ABM test launch (US DoD). Sprint ABM cutaway (US DoD). Andreas Parsch, Martin Marietta Sprint, Astronautix.com, URI: http://www.astronautix.com/lvs/sprint.htm. Baucom D.R., Developing Missile Flight Controls: From Guide Sticks to Impulse Thrusters, Advances in Technology, in Cameron R.H. (Ed), Golden Legacy, Boundless Future; Essays on the United States Air Force and the Rise of Aerospace Power, Air Force History and Museums Program, 2000, URI: http://www.afhso.af.mil/booksandpublications/titleindex.asp. ИЗДЕЛИЕ 9М82, Техническое описание, 9М82.0000 ТО, 1984 (Article 9M82, Technical Description, 9M82.0000 TO / Technical Order document, Soviet MoD). ИЗДЕЛИЕ 9М83, Техническое описание, 9М83.0000 ТО, 1982 (Article 9M82, Technical Description, 9M83.0000 TO / Technical Order document, Soviet MoD). Adrian Ochsenbein, SA-12 Gladiator/Giant, Technical Report, Defence Threat Information Group, V.8, June, 2011.